Last weekend I feel like I lived the through the 50 Shades of Gray. EWWWW, NO! You all have really dirty minds. I mean, I lived through 50 shades of…painting gray! I had no idea that gray was such a hard color to pick. I thought you mixed black and white and voila – gray. That’s totally not so. We went through about 7 shades and 4 trips to the pain store in one day. And by “we” I mean “Mel.” It’s a good thing he loves me a lot. Getting ready for this kitchen remodel is driving me insane. We had to pick a paint color that would match the gray-brown/teal/green curtains, the greenish glass tile, and the marble-like quartz. And that paint color needed to be photograph friendly. (Bloggers – you get me on that right? Nothing screams problems like a colorful wall.) Gray was the obvious choice. It only took 7 tries to find one I we liked. We painted one wall (so we could hang the new TV, priorities) and sat back to literally watch paint dry. Gray is a weird color; depending on the light I like it more or less. But there is no way I’m looking at more paint. I’ve moved on to lighting. Now that is a hard choice. That’s a whole other post in itself. 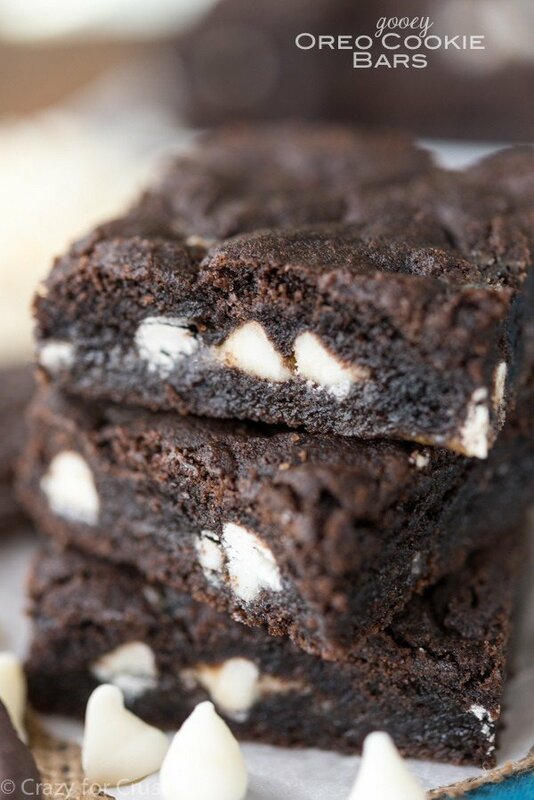 In the meantime I’m self-medicating with Gooey Oreo Cookie Bars. Will you join me? 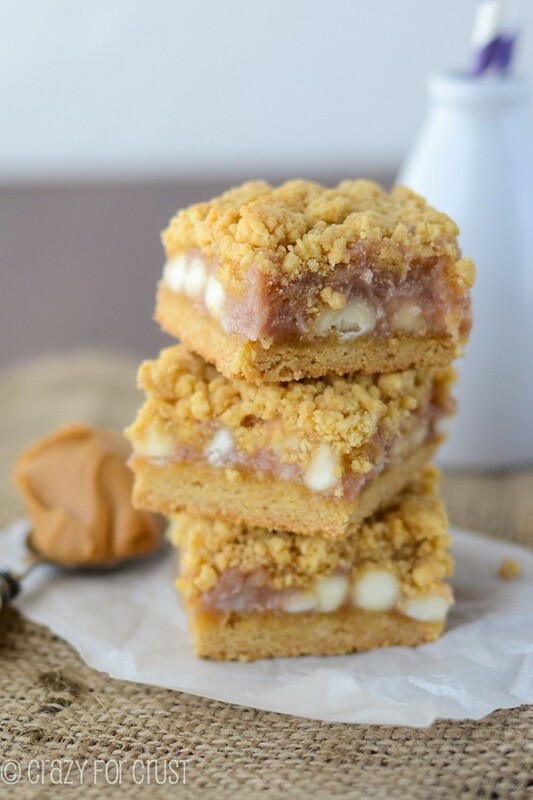 These bars were rated #1 by Amy’s son, so you know they must be good. The entire plate disappeared in an afternoon, which also lends credibility to their amazingness. In brainstorming recipes, I realized I’d never made Oreo Gooey Bars. I’ve made Peanut Butter Cookie, Funfetti, Lemon, Chocolate Chip, and a gazillion more, but never one dedicated to Oreos. I thought about using a cake mix but then I thought, what if I turn my Homemade Oreo Cookie Recipe into a gooey bar? 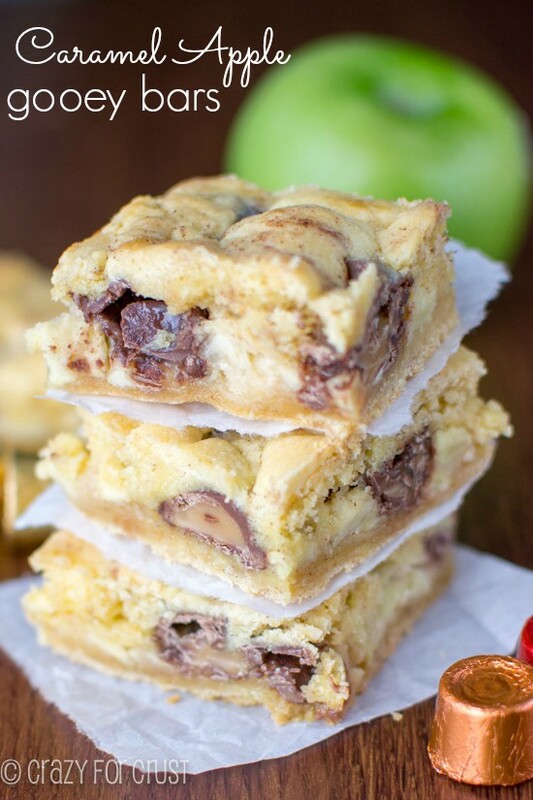 I could press half the dough into the pan, layer it with sweetened condensed milk, white chocolate, and Oreos, and then layer the rest of the dough on top. Then I could bake it and all would be right with the world. I was right, BTW. 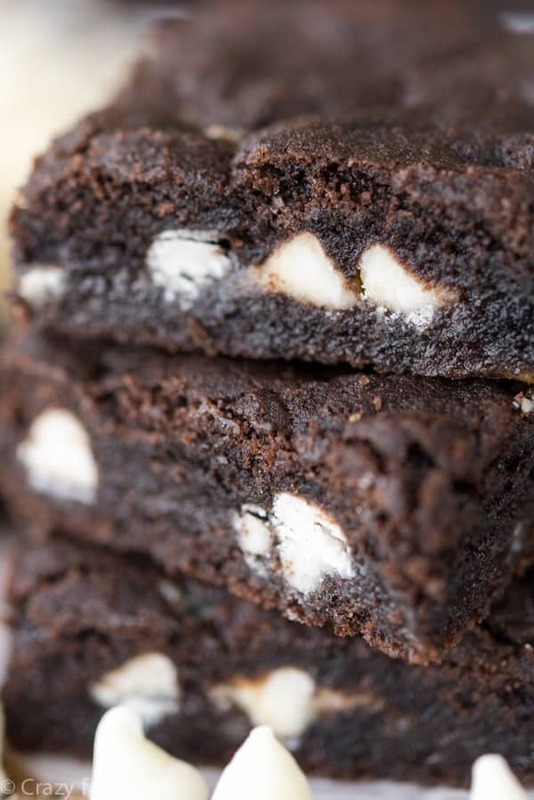 Gooey Oreo Cookie Bars FTW. Maybe I should have just painted my house Oreo color. It would have probably been easier! 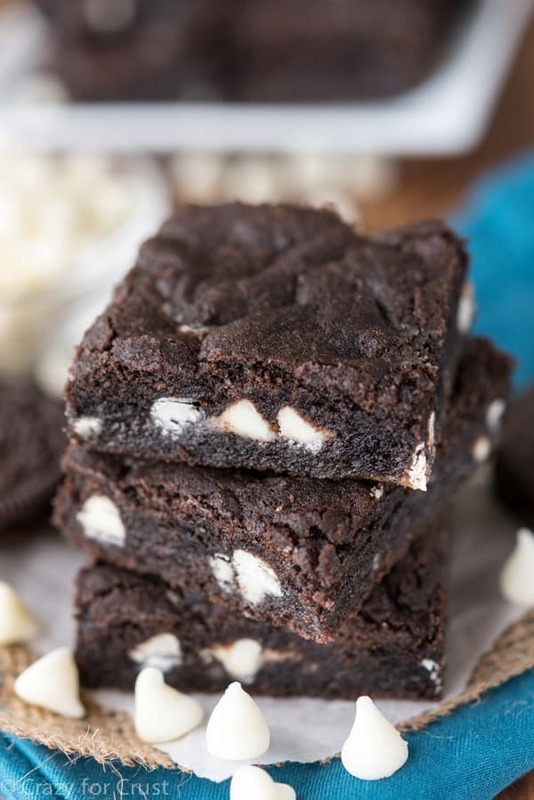 These Gooey Oreo Cookie Bars are out of this world! A homemade Oreo cookie made into a bar and filled with white chocolate, sweetened condensed milk, and chopped Oreos! In a medium bowl, whisk together cocoa powder, baking soda, salt, and flour. Set aside. In the bowl of an electric mixer fitted with the paddle attachment, cream butter and both sugars. Mix in egg and vanilla and mix until smooth. Add dry ingredients and mix until combined. Press half the dough into the bottom of prepared pan. Sprinkle with white chocolate chips and chopped Oreos. 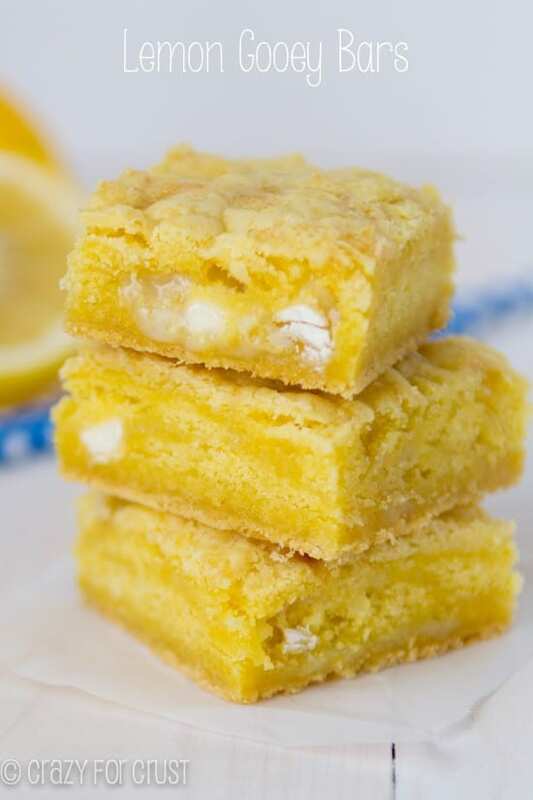 Drizzle with sweetened condensed milk. Drop remaining dough by spoonfuls over the top and spread lightly with your fingers. Some of the filling will show through, try to seal the edges as much as possible. Bake for about 27-30 minutes util the top looses it’s glossy sheen and they look dry on top. The center may jiggle just a bit still. Cool completely before cutting into bars. Hi! May I know if the sweetened condensed milk can be omitted or perhaps substituted with sugar and milk? Only if you cook it down. Otherwise it will be too liquid. Our niece brought this for a family Christmas get together. It was a great hit. It is now one of my favorites.